I’m a mom (to 2 boys, 14 & 18), a wife (my husband is a musician/university administrator), a biology teacher to non-science majors at the University of Redlands, and…an art quilter, struggling to fit all these hats on my head (note: none of these hats is that of a housecleaner!) I’ve begun merging my worlds by writing about what I do in various Art Quilting Magazines (28 articles at last count!) 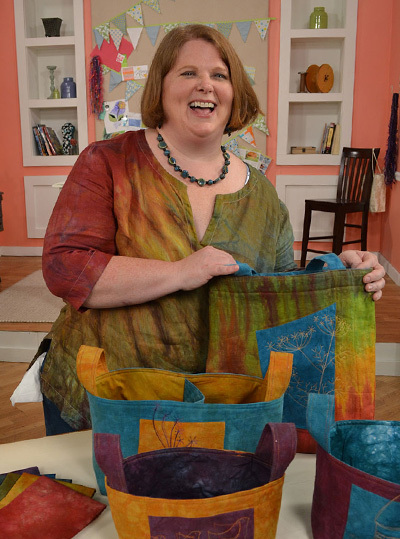 and appearing on 8 different episodes of Quilting Arts TV (see here for details), I have a 2 Quilting Arts Workshops (Dyeing to Stitch and Free Motion Machine Sketching), I teach Free Motion Quilting classes regularly at my local sewing machine shop and I teach online dyeing classes, so I can share my love of color, and the skills to create it, with lots of fellow color lovers! Sign up to be notified about special offers! Check the boxes of the classes you are interested in.